TIU 11 would like to announce a series of STEM workshops available for MSP participants at the TIU 11 main office in McVeytown. These workshops will provide deeper dives into some of the tools and techniques you encountered over the last several years and will introduce several new ones as well. Currently, we have four workshops scheduled – September 28th, October 20th, October 25th, and November 18th. The workshops on September 28th, October 25th, and November 18th are scheduled 9AM to 3PM. The October 20th workshop is a half-day event scheduled from 9AM to 12PM. Lunch will not be provided, though we will be coordinating a pick-up order from Harshbarger’s Sub-and-Malt in McVeytown. If you would like to place an order, please bring cash. The term of the grant will permit us to cover the cost of your mileage for the September workshop. Unfortunately, we will not be able to provide this funding for the subsequent workshops. At this point, these workshops are available to MSP participants only. However, if you have colleagues who would be interested in attending, please encourage them to register, but they will be placed on a waitlist. If space permits, those individuals will be invited as well. Connecting your circuits to the internet. Note: Starting this year, the ACT Consortium (a new partnership among IUs 8, 10, and 11) will be hosting a FIRST LEGO League robotics competition for the Central PA region. 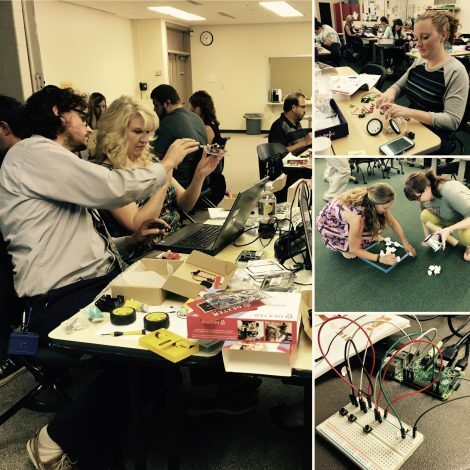 If you are an MSP teacher attending this workshop and are interested in putting together a team for the LEGO competition, we will have a limited number of LEGO EV3 kits available to borrow ($450 if purchased). As a team, you would still be responsible for registration fees and the 2016 competition kit.